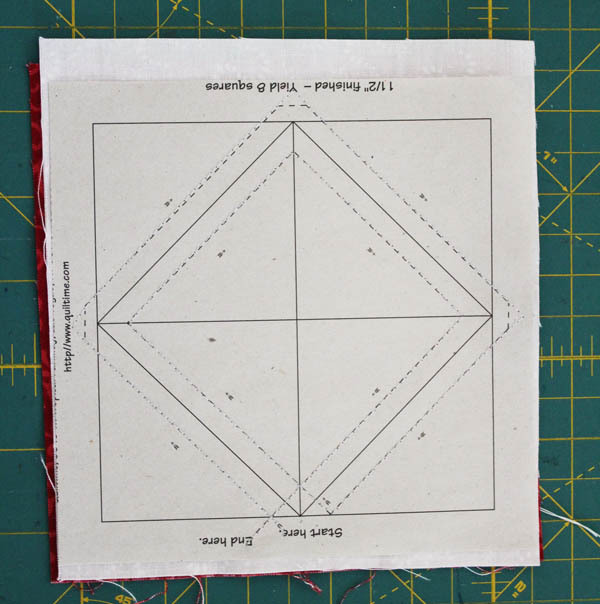 If you’ve ever tried quilting, you’ve probably encountered the half square triangle. The half square triangle, or HST, is a square made of two right-triangles. The seam connecting the two triangles runs through the middle of the square from corner to corner. Right along the bias. In woven fabric, the fabric most commonly used in quilting, the threads running one way are called the “warp” (parallel to the selvedge), and the other way is the “weft” (perpendicular to the selvedge). When you cut at an angle, across both the warp and weft threads, you are cutting on the bias. A bias edge is very unstable for quilters. Fabric cut on the bias stretches very easily. When stitching two bias edges together, as you do when stitching together a half square triangle, it is difficult to keep the block square. The feed dogs are pulling on the bottom fabric, the presser foot is pushing down on the top fabric, and if you are like most stitchers, you’re either pushing the fabric in or pulling it out the back. All these forces stretch the fabric at the seam. To prevent all the problems that this stretch creates, quilters have come up with a very clever solution: triangle paper. Triangle paper makes creating HSTs both faster and more accurate. A double-win any stitcher can get on board with. There are multiple brands of triangle paper available. Today I’m using triangle paper by Quiltime, but you can also check out the triangle paper made by Laundry Basket Quilts (this triangle paper is the perfect size to use for fat eighths), and Triangles on a Roll (great for making a couple or a lot). If you’re so inclined, you can even print out your own triangle paper! There are plenty of other products out on the market as well. The easiest to use are printed on a paper that is easy to tear, like newsprint. If you plan to print your own triangle paper, I recommend a paper designed for paper piecing, like Carol Doak’s Foundation Paper, which will tear away easily. Place your two fabric pieces, which should be slightly larger than your paper, right sides together. Place the triangle paper on top. You can pin it in place if you need. With smaller papers like this one, I usually don’t. Shorten the stitch length on your sewing machine. 18-20 stitches to the inch (or a setting of 2.5, depending on your machine) should work fine. Start stitching at “start” and stitch along the dotted lines. When you get to a corner, put your needle down, lift your presser foot, pivot your fabric-paper-sandwich, put the foot back down, then keep stitching. Stitch all the way around until you get to the end. The paper has both dotted lines and solid lines. The dotted lines are for stitching. The solid lines are for cutting. Once you’ve stitched the paper, cut on the solid lines. There are no “rules” as to which lines to cut first, but I like to cut off the outside, then cut through the middle lines, then cut the angles. It is important that you make your cuts right on the lines. Inaccurate cuts will result in squares that are not uniform in size. Once you’ve cut the fabric-paper-sandwich into triangles, it is time to tear off the paper. This was the reason for shortening your stitch length. More stitches per inch will give you a stronger steam (to stand up against the strain of tearing the paper), and perforate the paper more (making it easier to tear). Gently tear the paper away, like tearing a check out of a checkbook. Don’t lift the paper too much as you tear, that will pull on the seam. Once you’ve torn away the large piece, the small piece of paper on the seam should be easy to peel away. Put the paper in your recycling bin after you’ve torn it off. It cannot be re-used for quilting purposes. With a hot iron, press your triangles open. Your half square triangle units are complete! I like pressing my seams to the side, but you absolutely can press them open if you like your seams pressed open. Triangle paper allows you to make multiple triangle units at once, and the bias is supported because you are using a larger piece of fabric. You’ll find using triangle paper faster and more accurate than traditional methods for creating half square triangles. Triangle paper is sold by the finished size of the triangle. “Finished size” refers to the size it is in the finished quilt. So, a 2″ finished HST will be 2.5″ after you press it open because of the 1/4″ seam allowance on all sides. By stitching multiple pages of triangle paper, and varying the fabric on the top and bottom each time, you can create very scrappy looking HST quilts. The HST is one of the most versatile units in quilting, and you’ll love how easy they are to make with triangle paper! Thank you for writing such a wonderful and easy to understand review, now I know exactly how to use this paper! I’m so sorry I cannot answer this post is old. Google it, perhaps?